As the months have gone by, I’ve become more and more committed to the work I’m doing on this blog, and developing these ideas and relationships. It started as just a blog for ideas in October, and now has been my portal to the world for sharing my passion with others. Ideally, I would like to continue to do this as my career or life work. As the months have ticked by and graduation is visible on the horizon (December, woo! ), I’ve begun to feel an apprehension about what’s next. I don’t want to have to “get a job” – (i.e. do work other people want me to do) – but instead continue to follow my passion and figure out a way to have a sustainable income while doing it. I’d like to think that what I do here – discussing the evolution of technology, communication, social dynamics, culture, business, and consciousness itself – is a valuable and worthy pursuit. From the constant positive feedback I receive here, it seems others would agree. So, based on these observations, and some helpful suggestions from people who advise and guide me, I have a proposal for a business model that I think could work for many of us who are committed to advancing humanity for a globally cooperative, collaborative society. Ever since my Future is Networks post, I’ve been thinking about how we can better identify our inner strengths/skills/abilities/gifts and then share them with others. I’ve been thinking about what “value” means, and how we can exchange this information with each other that could probably be described as tacit knowledge or wisdom, and how you could quantitatively define something that is inherently opaque. (i don’t think you can, so i’m not going to bother trying anymore). All I have discovered so far is that the most effective means towards helping people along their path of self-discovery, or helping them redefine their mission statement for their life or their business, or constructing a vision for their future, or transcending past hang-ups and fear and illusions, is all through conversation. I posted my first recorded Conversation a few weeks back, and I’ve seen a tremendous response, both in the comments section, through personal emails and communications to me, and in writeups on other people’s blogs. (i cross-posted two of them here – 6 Tips for Open Collaboration & Guidelines for Engaging in The Conversation). This leads me to believe there is value in these types of generative dialogues, in order for people to clarify their goals and intentions, establish plans and frameworks, and move forward with action. The conversation is also about creating a vision of the future. The future I am interested in manifesting is about cooperation, and if you read the writings of people like John Hagel, Umair Haque, Seth Godin, and other progressive thinkers, it’s clear that this “Shift” is already underway in corporate culture. Those that want to stay in the game will have to choose to understand this shift and adapt their organization to it, or take responsibility for what will happen when the structure they operate within no longer fits the business environment. My understanding of these shifting dynamics is that they really begin within, at the individual level, with the ability to shift between multiple perspectives and adopt new ways of operating and seeing the world. This shift in mindset can then be shared with others, and slowly a shared vision is formed, and a new culture can emerge. The shift to a new culture is about redefining the operating system – internal and external. So it comes down to values, morals, ethics, principles, and trust. How do we want to live? How do we want to be? By what means do we want to earn wealth? How can we be successful without being exploitative? How can we live in accordance with our physical and social environments, with Nature and with society? I’ve been thinking along these lines for a decade, and really working hard to refine my ideas more recently. I’m surrounding myself with a community of intellectuals that challenges my notions of reality, and so my own perspectives are constantly broadened. No one can predict the future or can know exactly what will happen, but I feel as qualified as the next person to discuss the kinds of values that would be necessary (or desirable) in order for a healthy global society to emerge. In the past weeks, my time has been getting shorter and tighter, as more people want to Junto with me or skype chat or gchat or communicate in some way. I love it, and am grateful that I seem to offer people something that is beneficial. Now, how can I make this my living? I have an ability to speak with clarity, describe things from multiple perspectives, add in some intuition and insight, and at least make you say “huh. i never thought of it that way.” This is valuable for expanding consciousness and seeing a bigger picture, perhaps providing glimpses into opportunities that would otherwise have been invisible. So let’s talk about it. I will reserve blocks of time every week where I will make myself available for ‘The Conversation.’ I’m thinking that 1 hour is probably a good upper limit time, as a lot of these ideas can be exhausting to work through mentally, and there needs to be time to digest and integrate them. There are two things that I have to offer: time and attention. Both of those, to me, are priceless. And so any money I receive is a gift. You donate what you feel the value of the conversation was FOR YOU. This is based on your judgement, and your means. So, if you can only afford to give $10, there is no shame in that, just as there is no pride in being about to afford $1,000. Now, here’s the beautiful part. Because I believe that a cooperative society involves gifting, I think a Pay It Forward system of wealth distribution is beneficial for the entire society. So, at any given time, I will choose a person that is on the path to empowerment – people who are serious about wanting to follow their passions, have identified what resources they would need to make it happen, and are willing to take the risk of going for it, even if it results in failure. (failure, in my mind = temporary setback, learning experience, opportunity for readjustment of methods for achieving goals). I will make the amounts of the donations I receive transparent (if the donor wishes to remain anonymous, I will respect that. otherwise I will list their name/organization). I’ll then donate a percentage of each of those contributions to my Pay It Forward Person, and continue to help them financially until they have the basic resources they need to get their business going. Kind of like Kickstarter, but peer to peer. I would then only suggest that the person I have helped would eventually do something similar for the next person, once they are stable. They don’t have to, of course, but that is how this chain of trust and resilience would grow. For me, the people I will choose to pay forward to will have to also be interested in a business proposition that is “for the greater good.” For instance, the person I have chosen is a local friend, Dean. He is interested in developing a sustainable handmade furniture business. 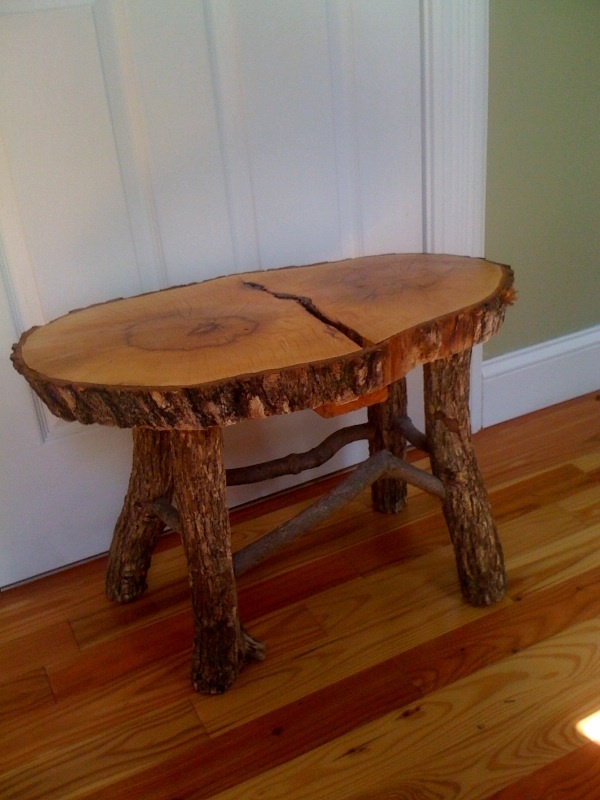 He has been in contact with local tree businesses, and is collecting wood that has already been felled, and is transforming it into unique pieces of art – from benches to end tables to chairs to custom pieces. He has identified a variety of tools and equipment he needs, the largest expensive being a portable sawmill that goes for nearly $12,000. We’ll work towards that, but just helping get the other basics going, as well as a website and an education on how to use the web to highlight these products will be huge. And not only do I help a friend, but I also support the local economy by helping him help himself. Here’s a pic of a sweet endtable he made for me to show what he’s been up to. Love it! So, that’s it. In its simplicity, I think this model has tremendous flexibility to be customized. There are many, many intelligent people who are Organizational Change Agents or work on personal development or coaching who could adapt this model for themselves. A part of this also blends beautifully with the ideas we’ve been discussing about growing our trust networks. When I am unavailable to have a discussion, I can have my list of trusted allies and colleagues whom I can recommend as an alternative to myself. We’ve also been toying with the idea of multiple participants as facilitators and participants of these conversations. So far, I’ve been speaking with Bernd Nurnberger (@CoCreatr) and Michael Gusek (@mgusek555) about the possibility of this, and we’re still on the front end of exploring what this might look like. The more conversations we have, the better informed we’ll be about what each of us has to offer, and what the most productive mix of people might be to have emergent, creative, innovative dialogues. Anyone who adopts this model can choose what their Pay It Forward part looks like. Maybe for you, it’s not an individual, but an initiative. Maybe it’s a local nonprofit. Whatever it is, is your choice, based on your values of what is important. I like the idea of empowering individuals, because I can directly see the impact. And how gratifying to know that you are doing something that has the potential to change the life of a person you care about? The percentage you offer is also your choice. 10%? 30%? 50%? Perhaps it varies based on each donation. Or maybe for you, the idea of a donation model is too risky, and you want to have at least a baseline charge for your time and services. I get it. Then do that. But pay some forward! This takes a leap of faith and some trust in the greater good, but I see genuine people all around me who are trying to create something better for themselves, and all they need is some resources and a support network. I offer both. I know many people who do also. I think this is one model that could quickly make significant change in the lives of people all around us, and I’d like to at least give it a shot. It’s a form of wealth redistribution that works in tandem with the “old system,” while creating opportunities for people who are ready to stop talking about what needs to change, and instead be the change they want to see. Image designed by the awesome Gavin Keech! Nice one, Venessa. One thing about tacit knowledge: While it is hard to write up, and may look opaque to a blog, it can be exchanged, though. By a mentor, by observation of a good example, for example. Show, don’t tell works here. i am realizing the value of “show” more and more every day. talk only goes so far – then we have to model behavior. You’ll find something very much on these lines in the P-CED white paper which proposed a theoretical model of inclusive capitalism which was followed up by a proof of concept initative in Russia. The model was placed in the public domain by publishing on the web in 1997. In the paper you’ll find the same reasoning you make for the contribution to be made for social purpose. A P-CED business is defined as “at least 50%” paid forward. The model was incorporated in the UK in 2004 and this interview later that year describes how it evolved and has been deployed in Eastern Europe. thanks for those links, jeff. this makes me think about the value (and necessity) of creating some type of guidelines that organizations and corporations could follow in order to be deemed “sustainable” or “socially responsible” or something like that. i don’t know if a national guideline like that already exists, but it probably should. i’m not a business or a non profit, i’m just a person, and i’m hoping to just directly help other people. i suppose if this “works,” there will have to be a little more structure involved than that, but the point is that i want to know exactly where my money is going, who i’m helping to empower, and to also know that that directly positively influences my local environment and economy. it feels like noticeable change would just happen a lot faster this way. i guess we’ll find out! we’ll find out together. i’m gonna start next week…. This is a really effective model. I think donations can or cannot work depending on many factors, but there are options to that. For example, I think in the US donations could work much better as opposed to Peru, but it may work here too. I will test it. The idea of pay forward it’s a way to take redistribution in our hands. The current model is a “lazy” model as we are expected to consume and the government will do the redistribution, but with some many interests going around the redistribution model has failed to work. Making it personal could make the political work out (which is what the Creativist Manifesto talked about). I think it’s time the invisible hand becomes visible in someway. Here I’m trying to make a model like that for technology startups. The Angel and VC markets here are really small and are mainly focused on commodities and exploration, so I had the idea of implementing something like the pay forward model. The idea is that we have a community that’s formed by a lot of people interested in technology that it’s named Lima Valley and we meet IRL a lot. What we want to do is to get donations for the knowledge we give away in the form of conferences, debates, conversations, lessons, seminars and workshops, and then pass this donations along to some of the startups as Angel funding with the only condition that they have to either invest in other startup later or give it back to us if they make a profit so we can give it to another project. This is a voluntary thing, so they will give it back just if they made a profit and feel like it’s the right time to give it back. The idea is to create a chain and develop an Angel investor market for technology. I like this model a lot and would like to see it go forward. I will think on a way to implement it myself. great, i hope it works for you too. i think this gives a sense of empowerment to the individual to be able to directly impact another individual, but it also requires more intelligence, as well as more responsibility. offering to give money away to someone to help them help themselves will open the door to being taken advantage of. it places responsibility on you to really know the person you’re planning to help, and to have a sense of their character, caliber, and initiative. you can probably expect to get burned sometimes. it is probably also helpful to project out scenarios of how this person could potentially utilize these funds, and then use your judgement to decide, over time, if the person is truly committed to making it happen, and if they are deserving of further assistance. it puts a lot of decision-making on the individual, and that is a challenge, but i think it comes back down again to fundamental values, and keeping in alignment with decisions that serve the idea of the greatest good for a cooperative society. This is a great idea and I think it will definitely work out for the larger good. In addition to the things you mentioned, what I like about something like this is the fact that others can learn and benefit from the 100s of years expertise we collectively have on various dimensions. Some time back you wrote a topic on what makes an expert and I know there were questions on how to ‘teach’ someone to be an expert. Well, this is one way. Listening to, talking with, and watching someone who has a much better grasp of a topic and knows the pitfalls to avoid is a faster way for others to learn and ramp up. as i’ve thought about this model more over the week, i am seeing how this could evolve into a globally distributed trust network of experts, and we could essentially pass people off to each other as they become more empowered and embedded within the community. i’m a front end person. i like to reevaluate ‘the way things are’ and find new perspectives and lenses through which to view reality and systems. i like clarity and simplicity, clear direction, creating a vision and a mission, and defining goals. i like creating the environment where new ideas and synchronicities can emerge. but, that’s not enough. there needs to be people who know how to create new structures, business models, steps, measureables, support, and so forth. this isn’t MY business model. this could be something we could all be a part of, stepping forward with our expertise and having laser-like clarity of where our attributes best fit within the course of a process, and how we can provide the most value. then, we assemble ourselves accordingly. imagine how valuable this would be for a person who is on the path to sustainability and thrivability and empowerment. to have a built-in network of the people who can help them, vetted by the trust network, so that all of us are doing this for the correct intentions in mind. you can’t really “infiltrate” this network. by definition, you are a person who has the greater good in mind, and so will provide advice/services/expertise for a reasonable rate and also pay forward to others. you can’t really “cheat” that. we build trust with the people we interact with around the world, and add them to our list of recommended people as we get to know them better and learn what they have to offer, and this is how this thing grows. Great thoughts and great added value ideas from the commentators. What I would like to do is clarify the understanding of those who may “resist” this new model before it’s had a chance to undo itself naturally. This system will reduce the “tension” of losing one’s insight, hindsight and foresight, by eliminating the fear of value in that system in terms of monetary terms. It’s not those as you hear commenting who believe in this that will make it work only, you are the front runners of conscious awareness, but it’s the one’s hiding in there rooms afraid to make a move because of the way the old system works. “As Alvin Toffler predicted in Power Shift, where once violence and then wealth were dominant forms of power, information is now becoming the dominant power. Those nations with the greatest freedom of information and means of transmitting it have now become the most powerful and influential, and the strongest economically. Toffler also predicted the collapse of the Soviet Union would come about due primarily to its authoritarian control and limiting of information. Unfortunately for Russian citizens, this old habit has continued for them beyond the collapse of the former Soviet Union and will at the least make an interesting case study on the survivability of a once strong nation which still remains committed to limiting and controlling information. When deployed in Russia, a typical reaction was “You’ve come here to create business ideas then give them away to other people, are you more communists or just crazy?”. What’s been shared since begins with the IP in the model itself, published on line free to use in 1997. Classic philanthropy, social enterprise and CSR do not go anywhere near the organised crime and government corruption which causes so much poverty and hunger. Virtual economies co-exist with it. Real issues, such as the one we tackle now with children abandoned to state care and forgotten while mafia siphon government funds intended for their care, exist in the current economy and have to be tackled. There seems to be something of a chasm between intellectualising about these things and getting on to do something, unfortunately. those that are “resisting” the idea are exactly the ones i want to talk to. what is it that is being resisted? what is it that’s truly important in your version of the world, and is that truly what’s important to YOU, or what you’ve been told to think and value? let’s talk about it, unpack it, talk about the role of identity and social relationships. i mean, that’s the fundamental of what this comes down to. the idea of “tangible results” happens as you go and as you choose to add more than one way to look at things. YOU change. you expand your cognitive capacity and ability to see multiple scenarios unfold, and then make intelligent decisions that will lead you in the direction of the most preferable of those future scenarios. what is a preferable future scenario? what do you want? what kind of positive vision of the future can you weave? can you develop agency? are you willing to disentangle yourself from being a programmed node in the system, and instead begin playing with the tool of programmer? if the answer is “yes,” then let’s talk about what you are, what you’re able to do, and who you could link up with in order to make that happen. I really love this idea, as it completely aligns with my concept of a virtuous society. It also feels like a natural progression to manifesting the trust-nets we have started to build. Thank you again for the inspiring share. Awesome! I’ve been thinking about my own business model a lot lately too. I want to say that I really appreciate your service to others and your example, which is the highest gift you can be. Technically you are creating your own job. I’m trying to do the same thing. Also, you are already doing the work I want you to do! And you’re doing it for free, which makes me smile. Passion is the work more of us need to take up, even if we stick with the “old” system to keep our bodies going day-to-day. I think the term value gets tossed about as casually as coins sometimes. I’m curious why you put it in quotes? You say it is inherently opaque, but value is actually amongst the most transparent of human concepts. When you can’t see the value, that is when the world becomes confusing and opaque. 🙂 In my opinion, value is the one thing that humans perceive they can create without “God’s” help. It shows us our power. It shows in our choices and is an expression of free will. The trick is in harnessing and using the power of valuation to work with the flow of energy rather than trying to control and contain it. On another note, I think there is an inherent problem with the word priceless that cause people to misunderstand and misuse it. Priceless, imo, can only be applied to that which cannot be owned. You mention knowledge, there is also love, peace, joy, etc. These fall into the unownable category quite well, and I think you use priceless with the correct intention. The problem is, people also associate “priceless” with the idea that it cannot be assigned physical value or currency. I believe this is a huge mistake that our communities have made! In essence this one false idea keeps the non-profits from succeeding in their goals, and keeps the war machine happy and strong. The profit community is, lets face it, very fast at achieving stuff. Speed has become way over rated, but it is a reality we are facing and our addiction is still growing. The thing about knowledge and sharing it, is this is costing you money. You pay for hosting, electricity and a variety of infrastructure to share what you do. If you don’t charge enough to cover your costs and keep food on the table you won’t be able to do your job. I think you will be quite successful with your current pricing scheme, so long as you choose your customers wisely, which I think you are already doing. Thanks for choosing me! My value is rising because of you and I need that. The other cost is time, the funny thing about time is it is priceless too (ie we can’t actually own it), yet we price it all over the place and then feel bad for doing it. Money is not evil or good though it may have touched corrupted or holy hands. It is a neutral tool and only supports what we spend it on. The key is to spend it. When we hoard it we destroy ourselves trying to become a secure vault. You get to choose what you spend it on or invest in. Spend it on what you really value and you’ll always be paid back in similar if not greater amounts, thought it may not be in cash. Perhaps you will get love, knowledge, or even peace and I think it is time we call in some debts and pay a little more to peace. I want to do the conversation with you again sometime, especially now that I know the price. I don't have any money, in fact I'm in serious debt from the twenty-some years I spent asleep in the machine, but I love listening to you figure things out and nudge you when you run into anything that seems opaque where together we might see it a little more clearly. Thanks for writing! Your talent is growing. thanks, scott. let me try to clarify what i was thinking of when i was talking about value and pricelessness. my main interest, when it comes down to it is building intelligence and the expansion and evolution of consciousness. we talk about a lot of other things that are built on top of that, but that is the crux. so, if via these dialogues, we are both able to learn from each other, expand our minds, adopt new perspectives, further understand how to transcend ego and sit in the witness seat, to use identity and attributes as tools in order to help us more effectively navigate life within this system and manifest the type of situations we want to create, to have clarity in our words, and clearly communicate with other humans without misunderstandings and confusion, to carry out tasks without precision without wasting time, resources, or energy, to develop strong relationships and resilient communities, to experience more happiness, joy, love, peace, and wisdom……..
how do you place a value on that? that is what i meant by priceless. we can put a monetary value on it for the sake of exchange, but when it comes down to it, these things can not be assigned a dollar sign. we’re just getting started. let’s talk soon about how we can work in tandem. The internet allows us to create a gift economy but only people can make it happen by supporting each other by participating in new economic relationships like the one you described. Our website BEEx.org is a fundraising platform designed to help gift economies emerge by enabling people to say what they’ll do to raise money for a nonprofit organization. Imagine more and more people relying on funds raised through nonprofit organization to earn a living. At first it sounds impossible (The dollars will run out!) but what happens when you can raise things other than dollars: hours, local currencies, products and services? Then you’re working to create value for your friends, not institutions. When we start working for each other, we’ve entered an abundant future. Giving without a single thought of what you will get in return, spilling your heat out with gifts from God, feeling your feelings as you do so and no fear in every failing because you’ve opened up yourself to sharing and caring with others. yeah, it’s great, and it’s already happening, we are just becoming more aware of that fact. call it “gifts from God” if you like, or whatever terminology works, but for me this is just intelligent behavior. i don’t want to use any kind of language that is going to devolve into the realm of pop psychology or woo-woo magic. the web has allowed us to connect and share information resources on a global scale. how do we create optimal mental environments so that we can engage effectively with each other and share so that we can improve the quality of our physical environments and our relationships with other humans? Rachel Botsman talked at TEDxSydney (link below) about how technology enables trust between strangers, how this shifts an industrial consumer’s society from the need to own stuff towards collaborative consumption, as she calls it. If what you want is the holes in the wall, why own the drill? If it is the music or video you want , why own the CD or DVD? You can rent, borrow, swap and trade. This stuff-sharing works well because of reputation, the digital trails of transparency we all leave through our transactions. Now you add your offer of collaborative services to the mix. Because you let Clients (by habit I capitalize “Client” and “Customer”) choose how they compensate your for time and wisdom, you can choose your Clients, too. I wonder how you do scheduling, priorities and negotiation? Would you be interested to co-create a few business models with the canvas in, say, an hour on video-skype or Junto, keeping realtime notes in a Google wave or on MixedInk? About Rachel Botsman’s talk, here is how this found me. You’ve got Junto already in the works. It’s a brilliant idea! Figure out how to take that for the ride it deserves. Scott Lewis makes a good point about “priceless” and its’ cost to you to continue to offer your benefits to the world. I know it feels great to offer for what people can pay what you want to do in exchange for a sense of your own mission in the world…but by offering your work in this way, you take away the feeling of a fair trade from others who will hesitate to come back for repeat business. Take a stab at setting a monetary price for your work, (even if you are planning to ask purely for donations to fund it.) To do this, find out what others are asking for the same work in your area. You can always indicate that other arrangements are acceptable. You can always give discounts to repeat customers and freebies to those who are using your services for the first time. You can always accept donations. But if you do not indicate the FAIR monetary value of your work, then there is a danger that you’ll be driven into a financial hole over time and will not be able to continue. Remember, those who want what you offer are also those who also do not know the value of your work either. That is why this value needs to be set by others who are doing the work professionally – not you. There are many models for how this can happen in accord with your principles and visions already in place – and doing the creative thinking about how and why they work will help you design a new model as you are so agile at innovating! One of the ways of doing this is to set a goal of money needed for a certain period of time, related to a certain project vision – in some situation like http://www.kickstarter and then ask for the support to make it happen. Selling sponsorships, getting endorsements from businesses and those who know you – Think about why other people would offer their commitment to you for value you can provide for them that they recognize. Look at what you offer from their point of view. Another way to do this is to get a baseline “good enough” job, (Einstein worked at the patent office) to fund your other passions. As far as the best skills to learn to become more professional that you may not already have studied in school and haven’t mentioned yet – that would be public speaking. …And making presentation videos. @ Franis – I think your comments are spot on and make sense for most consulting situations, but that this model has a built-in twist that works best w/ donations. It depends on the viral spread of the resulting content/conversations to propagate it – this could be very powerful. People will be more likely to approve sharing of these conversations with the world if they feel they the rate is adjusted accordingly (lower, closer to their comfort zone). So, though it’s a bit of a risk, it seems necessary to give this model a real go of it. That said, Venessa, you may still want to post a general or suggested rate. Or suggested rates for different categories of conversation. Would be interesting to see a sliding scale rate graph / curve. Random thought: maybe there’s a way to link together the conversations and Pay it Forward beneficiaries in a way that brings them into the conversation. Eg, Dean could become part of the conversation chain. I suspect there are some game rules that could serve as the glue to link peeps up like that. Why don’t we try crowdfunding one or more of pilots that would get Venessa in a sustained conversation with other thought leaders? As an example, I would love to see her interact with @dougrushkoff on alternative currencies, @clayshirky on free institutions, and @jhagel on pull. Others would doubtless have as or more exciting candidates. Through pledge sites such as Kickstarter, Pledgebank or TippingBucket, potentially substantial amounts might be raised. If Venessa agreed with the formula, one third of the funds raised could go to her (and/or EBD), one third to a pay-forward venture of her choosing, and one third for a pay-forward cause chosen by her partner in the conversation. I think such an approach could help Venessa connect with many influential people, create amazing conversations, and more rapidly extend an appreciation of #junto as a nexus for expanding frontiers. Great idea. While this would mean funding two participants per session it would also help Venessa establish, um, her “fair market value”. I would add @stoweboyd. Hey, we could even call a competition, let’s see which conversation pair gets crowdfunded the fastest. Or which participant first feels inclined to say, “I donate in full because I want this talk with Venessa in public, now.” Imagine the spotlight and the stagefright… then grow through it. Great direction you are taking here, Venessa. To give an illustration of the depth of changes I see potentially inherent in your initiative, let me share here a poem of Nabil Naser, that I came across this morning. It was posted to the Natural Philosophy Alliance’s Ning community page. There are some people who separate themselves from others by whether they ate or not. They are not angels, and are ignored by those with full stomachs. Needless to say I agree with spiro that your model is not only a business model, it is a potential game changer, an important update to our society’s operating system. Thank you for being there and doing what you do. Love it! Sounds like a great model that could help many…cant wait to see how this could change Dean’s life too. Interested to see what kind of time frame for significant progress is necessary. Ill be keeping tabs on the the two of you! dean already has the basics he needs to get going. a slick website and some local promotion will go a long way to get his name out. i can think of a handful of places that would carry his stuff. from there, it’s a matter of getting that solar powered cutting machine and more experience. i could help him make videos he could post to his site that shows his process of start to finish, from collecting the logs to actually building the product. eventually, he could make a secondary income in teaching others how to do this or running workshops. Your “pay it forward” model is hugely inspiring in all of the various scope of its meaning! I start responding from the one that is the juiciest for me, the scope of our Emerging Planetary Reality. We’re in the midst of a world transition that still has to generate highly-scalable practices of value creation and exchange beyond the logic of the incumbent mode of production. I see your quest in the context of that larger one. i read through a bunch of stuff on your blog, it looks great. do you want to have a chat soon? If the root motive is to make a living without getting into illegal cash gifting, my advice would be to start from a motive of wanting to help others. Wanting to make a fortune for yourself is normally the motive that blinds most people to the hard task which so often ends in disaster. Alexander, the link behind your name does not work, the first site redirects to a seller if I leave it, the third and fourth link offer a little information. What is your offer to this community? i have no idea what you’re talking about, so i’m not quite sure how to respond. i’m proposing a model that draws from the idea of tithing, and is a choice i am personally making to helping people that are important in my life to establish and empower themselves. Very nice. You can count me in. My interest is helping high school dropouts. My expertise is Print production and project management. Way over 10,000+ hours. My hope is that #ebdish might be a useful framework to capture at a general level precisely what accounts for the success of the many emergent success stories on the ground. When you are ready to play, @ DM or reply below. how about sometime this week, june 14 – 18? That might work on Wednesday. Could you DM or @ details of how it would work. I truly hope that you can make a decent living doing what you do best. Everyone should be able to do what they feel most passionate about and be able to live off of it. I’ve been reading everything I can find on the web – on your site, etc. – on Junto and on The Conversation. I truly enjoy what I’ve read thus far. Yesterday evening, I began having a strange response to Junto & The Conversation. I began being a bit of a devil’s advocate. I was mostly trying to see how it could be improved, and int he process I came up with some major flaws. I was mistaken. When I went back to the drawing board, I read some more, and I realized that I was making snap judgments and that I was mostly ignorant about what Junto really was. I ended up reading on the subject of Benjamin Franlin and the original Junto group. I was ignorant of what Junto really stood for. With that being said, I want to find the best way that I can contribute to Junto & The Conversation. I’m not looking for a new means of connecting and communicating via the World Wide Web. I’ve already got a million digital communication channels, I don’t need more information saturation. But I am however beginning to see how I could help Junto & The Conversation, in concrete ways, that is. I will keep in touch and will be lurking in the background, keeping up-to-date on the developments of the group, the phenomenon, the platform. I happen to have a gift for what could be called Applied Ethics. I don’t know if being a Libra has anything to do with it, but I have a well developed ethical sensibility / sensitivity. I can immediately see what is right and what is wrong about something, and I will find a just and friendly way to bring to the surface what I think can be improved. It’s not like I think that I’m more advanced than anyone else. I just have a special talent that I think can be shared in a great way. I made an initial video describing some of what I thought when I was being the devil’s advocate. This video is meant as an intellectual exercise. My goal was not to alarm people or cause you and the others grief. I have no official position on Junto & The Conversation, I am still just trying to read what’s been written & communicated, to be up-to-date. I’m still learning. i watched your videos, and i think i have not done a good enough job being clear on what i am doing. do you want to have a skype convo this week and we can discuss it? Sure, I can do a Skype convo. I recently signed up, though I’ve never used it before. I guess all I need is a mic and headphones? And it’s maybe not you so much that didn’t explain what you are doing properly, it’s also possible that I merely misunderstood completely, for no apparent reason. I’m apt at misunderstanding. I definitely don’t want to do anything to harm the momentum and impetus that you have going. If I saw that I was being destructive, I would remove myself from the discussion. Only a few people holding good observation skills see value of the idea at http://savetheworldfree.ning.com those who do not may need to improve the skills that at present seem to be letting them down. or could the problem be with the way the idea is presented? The answer to this question is not only important for the site creator but for the work being around the world for the natural environment. I don’t know where else to write more than 140 characters to you. I’ve been looking at what you talked to me about yesterday, the sound stuff. If anything, I can help lead you to the right information resources that someone would need to do what you are trying to do. Not sure it is in effect entirely possible in the way that you currently envision it, but that’s the name of the game, right? I can tell you what’s been done, link you to relevant research – as best as I can – and let you know what I think is your best bet. And if I can have a hand in it myself, all the better. Part of it seems to be a bioacoustic / biomusicology question. To hear a few notes of music and immediately “get it”, that’s based more on an individual’s ability than on any sort of “universal” trait, quality, attribute that you’re likely to find in a sound-based expression. I hope I’m not misplaced in using a public channel for sharing these ideas. If there’s a problem, just erase this message, but give me a way I can write you more than 140 characters at a time. Take care, hope you are well. Save lots of money and buy it from Marcin and co.
do you have a link for Marcin? That is the link, Venessa. http://openfarmtech.org is their project. I no longer work directly with them. It was by chance that I saw your blog reference on the Blog of Collective Intelligence and your ‘Pay It Forward’ business model and it made me not only smile but shout for joy. I am a learning specialist here in UK and run a small learning improvement company that helps people and businesses get more value from their investment in training and learning. Obviously, we talk about ROI in training, but moreover, we try to get the message across about ‘Paying-It-Forward’ in terms of return from learning events. We also practice as much of the principle as we can, not with money, but with our time to help individuals that need help learning how to learn as much as we possibly can for no financial gain (probably means we will never be financial millionaires, but who cares). I would like to take this opportunity to wish you all the success in the world as you are the very first person I have come across that doesn’t just talk about this BUT PUTS IT INTO ACTION.